If you think popcorn and Snowcaps top any movie experience, you haven’t seen anything yet. CinéBistro at Dolphin Mall, the first to open in the country in 2007, is a dream-come-true for adult moviegoers wanting to escape noisy theaters. With a 21 and older policy, the theater offers a grown-up, upscale setting – big, comfy leather seats, a full bar and gourmet menu. Seriously, why didn’t someone think of this before? Whether you buy your tickets online, or in person at the theater, you can select your seats on the spot. That means no long lines, or rushing to get to the theater before it gets crowded. 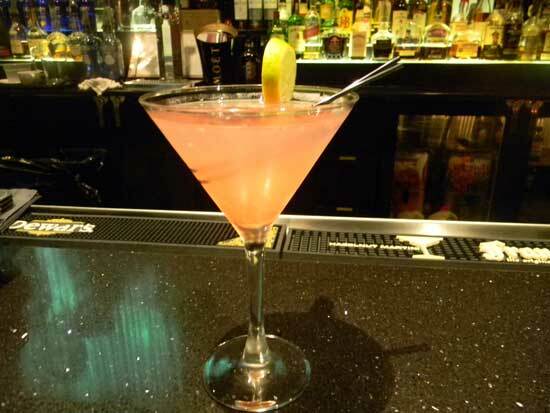 CinéBistro also offers complimentary valet parking, which, if you’ve been to the Dolphin Mall, is priceless. You pay the $7 up front and then get the ticket validated at the concierge desk. Seating begins 30 minutes before the movie starts and you can place your food order up to about five minutes before previews begin. The service is consistently above par, with a staff that is friendly and attentive. They will take the time to explain menu items and make suggestions. Now comes the only hard part: deciding what to eat. Nearly everything on the menu is absolutely delicious. Some items can be a little pricy, but it is still possible to indulge within your means. The key is to choose wisely, not necessarily go for the cheapest items. 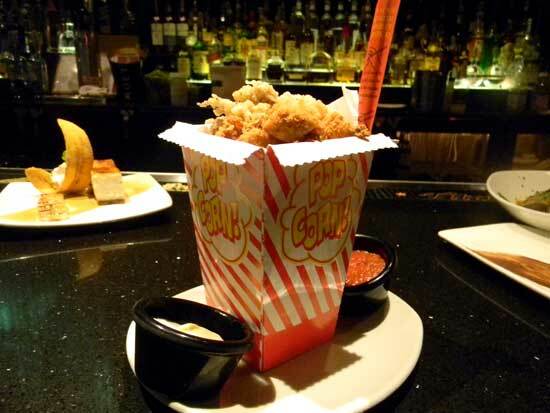 If you don’t want to splurge on a full meal, go for the Popcorn Chicken, Shrimp or Calamari (or a combination of all three) for $12. It comes served in a cute, old fashioned box with Charred Tomato Sauce and Lemon Garlic Aioli on the side. The Ceviche Mixto ($13), also great for sharing, brings shrimps, scallops and Mahi Mahi marinated in coconut and lime, and garnished with red onions, sweet potato and orange pieces. 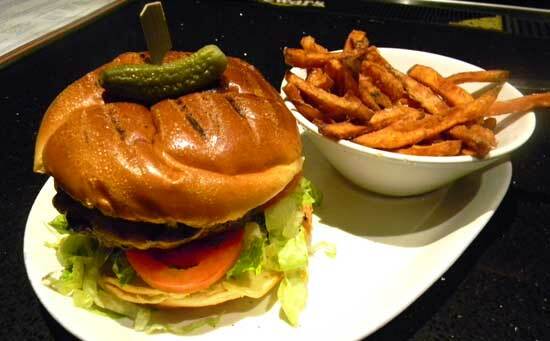 The Double Feature Burger ($13.50) is one of the tastiest items on the menu. Made with a combination of chuck, brisket and short rib, the meat is tender and juicy, even if you order it well done. It’s topped with Nueske Apple Smoked Bacon, cheddar cheese, red onions, lettuce, tomatoes, pickles and a secret sauce. You also get a side of regular fries, or sweet potato fries (at no additional cost). The Blackened Mahi Mahi sandwich ($13), topped with Cilantro Slaw and Ancho Ranch Tartar Sauce is also a winner. It comes with fries too. 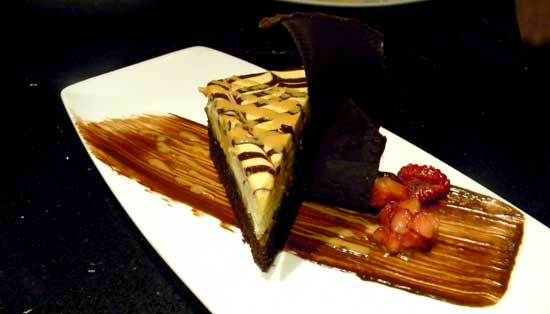 For a more substantial meal, we recommend CinéBistro’s most popular dish: The Churrasco Steak ($18.50). 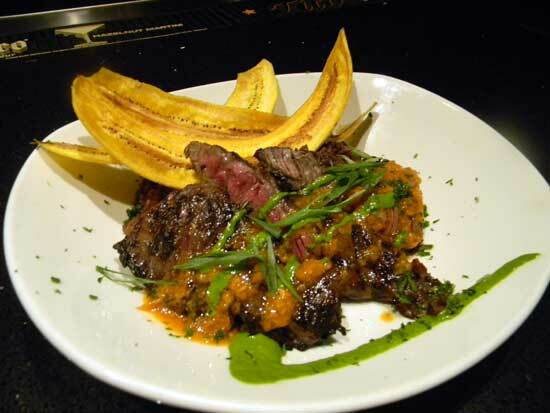 The skirt steak is marinated and grilled, and then topped with a Roasted Tomato Chimichurri Sauce, and served with mixed rice/black beans and plantain chips. 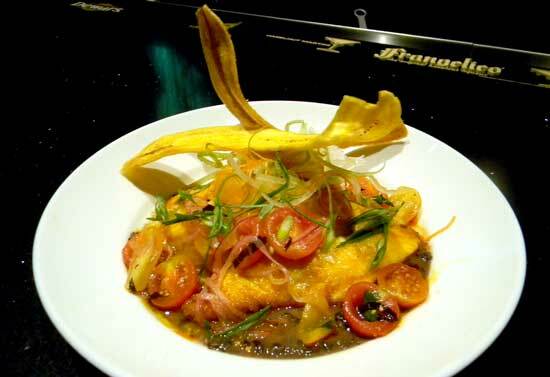 We also loved the Yellowtail Snapper with black bean sauce ($22). There are heavenly desserts too. 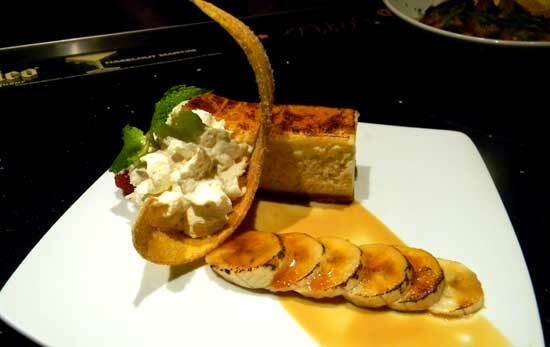 Try the recently-created Caramelized Banana Cheesecake ($8), or Crème Brulee Trio ($9). 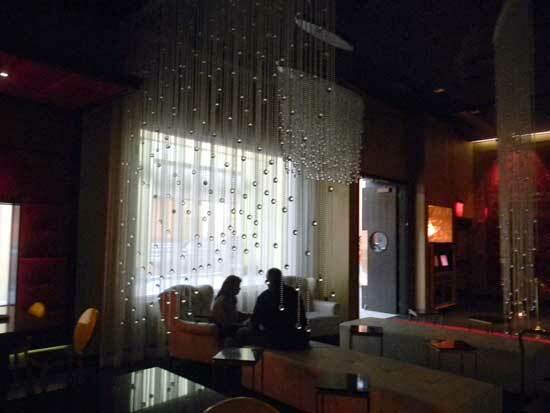 The theater also offers a full bar, popcorn (with free refills), fine chocolates, coffee, tea, and soda. 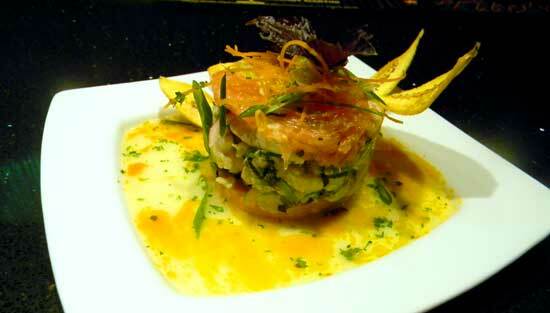 Even if you don’t have time to watch a movie, the food alone is worth the trip. 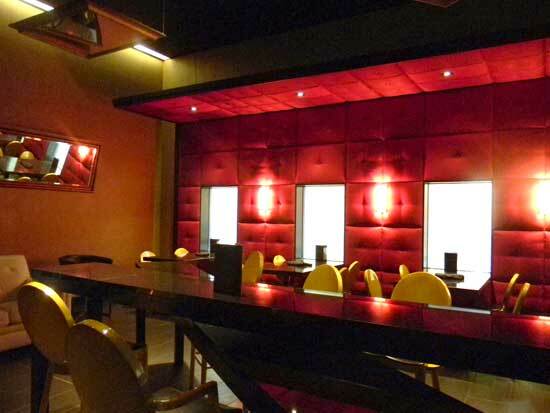 The bar and lounge area is sleek and elegant, a perfect setting for a special dinner. When ordering in the theater, keep in mind the tip is automatically added. On occasion, CinéBistro will host special events, such as an Oscar and Halloween party (coming up Oct. 29). They recently added Monday night football on the big screen. Don’t forget to apply for a free Club Ciné card, which allows you to earn points toward free popcorn, appetizers/desserts, and even movie tickets.